Jacky White brings to mind two of the most popular strains in the cannabis industry, Jack Herer and White Widow. The former is a Sativa-leaning strain that delivers an energizing high that leaves users feeling happy. Not to mention, it dominates the grow room with its impressive resin production and sturdy growing profile. Another heavy producer of trichomes is the well-balanced White Widow, which is Jacky White’s second genetic base. It not only coats buds in a white cast but also amplifies Jack Herer’s medicinal qualities while adding a recreational sociability. Jacky White exemplifies both its parents most attractive qualities. It induces quick-acting high that instantly brightens the day. At the same time, its stress-crushing head-to-toe buzz relieves various afflictions beginning that disturb one’s ability to live out life to its fullest. Meanwhile, its ease of growth makes it a great Sativa-leaning plant to add to the grow room. Jacky White has a tropical terpene profile. It has the taste of freshly-picked fruit with undertones of wet soil. However, its overtone of sweet citrus and tangy grapefruit take over once the buds are combusted and consumed. Its floral notes shine through in the palate as the smoke is swirled in the mouth. On the exhale, it leaves a subtle sourness with a tinge of earth. Jacky White should be used moderately. 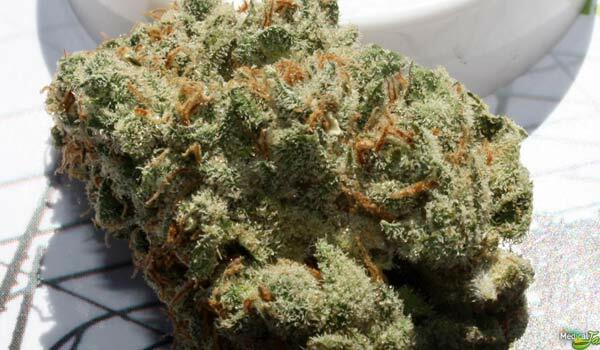 It is a potent strain with THC levels of 15% to 18%. If used beyond individual tolerance, its pleasant high can turn into an overwhelming buzz that slams the head immediately after the first toke. Using it within limits ensures that the psychedelic effects are limited to a pleasant cerebral rush that swarms the mind and clears away worries. The resulting mental clarity uplifts the mood. Without negative thoughts to distract the mind, users can reminisce cheery thoughts or create happy memories. It translates into the behavior as well; frowns turn to genuine smiles while a boost in confidence adds a bounce to each step. Abundant with ideas, one turns a little chattier than usual too. One of the best times to use the Jacky White is in the morning and noon, an hour before breakfast and lunch. Its stimulating head high extends down to the appetite. Having meals prepared ahead of time is highly recommended. Although, one can also head to the kitchen and dedicate some time into creating delicious food. Because it boosts sociability and prepares the stomach for appetizing meals, the Sativa-dominant herb makes for a great recreational strain. Even after two or three hours have passed, users still do not feel tired at all. The initial rush invigorating buzz continues to persist while soothing the muscles, resulting in a totally relaxed body and a clear mind. It turns users into limber, well-oiled machines who can perform tasks that require light physical activities such as cooking. Although it is an energizing strain, Jacky White is best used on a day off. Its mental clarity is more of a cerebral space instead of a sharpened focus that drives one to work through tasks. Smoking Jacky White can lead to more serious side effects from the typical dry eyes and cottonmouth. One of which is greening out, a condition that results from overconsumption. It is distinguished by a sharp but disorienting awareness that can raise anxiety levels or induce a feeling of paranoia. A sour disposition before the high can also be a contributor. Hence, one should not only moderate dosage but also avoid the strain during days when the mood is foul. Jacky White provides patients with a reprieve against a myriad of conditions. Its happy psychoactive high not only uplifts the mood, but also reduces stress. Meanwhile, its soothing euphoria calms the overwhelming dread and anxiety that often hinders interferes with one’s confidence. Because of this, it can also be used as an anti-depressant to manage symptoms of depression and other mental health issues like PTSD. Its uplifting head high also brings back the appetite. As such, patients with eating disorders like cachexia or anorexia can find comfort in the strain. However, before it begins to stimulate the stomach, it relaxes the gastrointestinal tract so users can enjoy a full meal heartily. Its painkilling properties ease physical pain and aches as well. It starts at the temples as a tranquilizing buzz that, as it relieves the muscles, invigorates the whole body. It takes away the exhaustion of the day or work week and releases it so users feel reenergized. Jacky White is, without a doubt, a sturdy strain. It has a strong resistance against mold and low temperatures. Hence, it can be cultivated by beginners who are looking to grow a Sativa-leaning strain for the first time. Growers may also place it outdoors in the northern hemisphere as it flowers early. Flowers can be expected from the last week of September to the middle of October. It produces at least 600 grams of buds per plant. Growers can further increase yield through training or extending the flowering period by a week. Indoors, Jacky White will need to be topped to keep it short. Managing its height also improves light and air circulation in the lower nodes. At the same time, it redirects more nutrients to healthier budding sites. Pairing it with the Screen of Green method is ideal. It requires placing a screen above the current canopy then weaving the branches into the net to even out light distribution. After flowering for about 7 to 9 weeks, Jacky White produces up to 500 grams of buds per square meter. Have you grown or used the Jacky White strain? If not, would you like to get your hands on this strain? Please leave a comment to let us know what you think. We want to hear from you.